Solid Hardwood and Birch Plywood construction, Natural Finish. "English Oak" Laminated Top with radius corners. 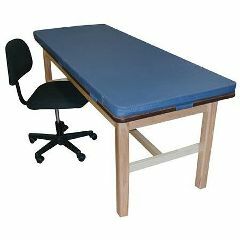 Removable Mat w/ Hook & Loop attachment, 2" thick vinyl covered mat with high-density foam, Imperial Blue standard color. wood stain colors are available, ask for current custom pricing! Galaxy by Sanitor Mfg. Co.